Garth Brooks and Taylor Swift were unknowns when they first performed at The Bluebird Cafe in Nashville. Now, they're superstars who both credit the club as the place where it all started for them. In business since 1982, The Bluebird has arguably become one of Music City's most famous clubs and one of the most renowned listening rooms in the country. It's a place where connections are made, stars are born, and careers are catapulted. But most importantly, it's where the craft of songwriting is revered. The club has even taken its own turn in the spotlight as a primary location in movies and on TV, most recently in ABC's hit show Nashville. You never know who will be in the audience on any given night at The Bluebird. For Brooks and Swift, it happened on a Sunday and a Thursday. Nashville is a major hub of the music industry, and industry folks frequent The Bluebird every night. This is the place to meet people who are doing what you're doing. Four artists will be selected to play a showcase presented by Sonicbids at The Bluebird Cafe on August 27. (Applications are free and are due tomorrow, June 19, so get those submissions in now!) But if you don't manage to squeeze onto that particular bill, never fear – you have other options for playing this legendary music venue. The trick is getting a slot if you don't live in Nashville and then standing out in a town filled with so much top-notch talent. Here's how to cut through the crowd and get your music heard at The Bluebird. Like many venues, the open mic is the easiest way to break in. Unlike other venues, getting a slot at The Bluebird's Monday night open mic is akin to winning the lottery. As of June 1, there's a new phone-in process to sign up for the open mic. Now, instead of coming to the club in person and getting a "play next time" slip if all the slots are filled, you must call 615-943-8168 between 11:00 a.m. and noon on the Monday you want to play. You can't leave a message. The first 25 people to get through get the slots. No priority is given to out-of-towners, so it's best to plan a trip to Nashville for other reasons and hope for the best concerning the open mic. Sunday Writers' Night is your next best chance to play The Bluebird. This is the longest-running show at the club, predating even the open mic. Songwriters are chosen by audition, which are held four times a year. Watch the calendar page of The Bluebird's website for audition announcements and info on signing up. Audition time is short – each writer performs one minute of a song, essentially a verse/chorus – so come well-rehearsed with your best material. Get right to singing the song rather than trying to dazzle the judges with fretboard or keyboard antics. It's all about the song at The Bluebird. If selected, you'll get to perform a mini-set of three songs on a bill with eight to 10 other songwriters. Full bands can play The Bluebird as part of the Sunday Spotlight. This occurs as a separate one-hour show before the Sunday Writers' Night. You're eligible for consideration for the Sunday Spotlight only if you've played at least four Sunday Writers' Nights or if you're a suitable touring act with significant national press. Drum kits must be small. Think acoustic cocktail lounge kit, not loud rock show kit. If you meet these criteria, submit material to: The Bluebird Cafe, ATTN: Sunday Spotlight, 4104 Hillsboro Pike, Nashville, TN 37215. Those who do well at multiple writers' nights may be invited to perform at an early show on weeknights or weekends. Slots at these shows are reserved for the best up-and-coming or established acts. You're eligible to be considered for an early show if you've played at least four Sunday Writers' Nights. Late shows are for top local and national touring songwriters. Only established performers with a large following or songwriters with charted songs are booked for the late shows. These are the in-the-round shows The Bluebird is famous for, where performers sit facing each other in the crowd and the stage is turned into a part of the audience where patrons sit at tables. For the lofty position it holds in the musical universe, The Bluebird is tiny and unassuming. The club barely seats 90 people. This adds to the intimacy of the shows. Most people are surprised by how small The Bluebird is on their first visit, and by its location in a small, suburban strip mall. There's no room for a green room, much less a backstage area. The only privacy is in the parking lot, where there will likely be a line of people waiting to get in to see you play (so no whining!). You don't really have to push a show at The Bluebird. The club rarely has empty seats, even for the open mic nights. Oh, and you won't get paid. That's standard for all acts, except for those who make it onto a late show bill, who get the door money. Other performers get an amazing opportunity to network, sell merch, and play in one of the best small venues on the planet. The vibe among musicians at The Bluebird is more collaborative than competitive. (It tends to be that way in Nashville in general.) Even if you don't get a chance to play The Bluebird at first, you should go to shows there and meet other singers and songwriters. Chances are your server will be one! If you are lucky enough to play this legendary venue, though, be sure to set your merch up next to the door and work the crowd. It's easy to do at The Bluebird, where everything is up close and personal, all for the love of song. 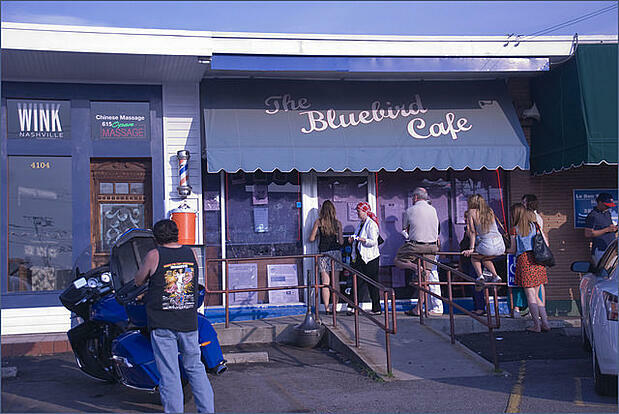 Don't forget to apply for free by June 19 for your chance to play The Bluebird Cafe on August 27! Blake Guthrie is a freelance writer, journalist, and musician with a longtime disorder of singer/songwriter-itis. His articles have appeared in print and online publications such as the Atlanta Journal-Constitution, Huffington Post, and USA Today. Concerning his disorder, Flagpole magazine in Athens, GA, once speculated that Guthrie was "either a psychopath or some kind of genius."